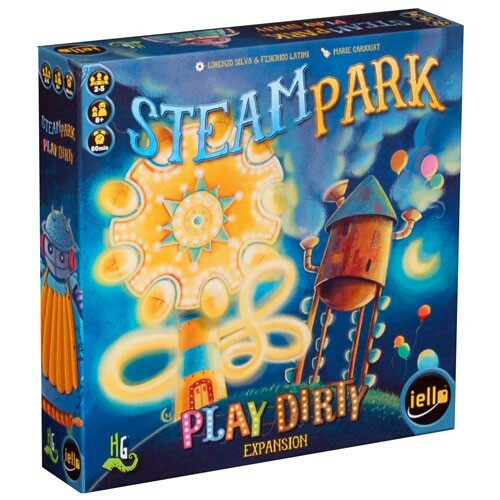 Steam Park: Play Dirty is an expansion for Steam Park by Lorenzo Silva and Federico Latini, published by IELLO. It is for 2-5 players. This is a modular expansion that allows players to not only add a 5th player to the game, but it also allows them to add lots of new game mechanics. These mechanics can be added a little at a time or all at once. It’s up to the players. For more information on the base game, please check out the link below. Before going into what this new expansion adds in forms of game play, let me give you a quick overview of how the original game is played. Each player starts off with some land for their park to begin building on along with some dice to roll. Players will simultaneously begin rolling dice. Players set aside any dice they want to keep on their pig board. As soon as they have all 6 dice on their pig board, they can grab the best turn order card available. For the slowest player, they get a penalty of adding dirt to their park. Players will then take dirt tokens for each dirt symbol rolled on their dice as well as for any visitors they have in their park. Once players have collected their dirt, they’re able to build rides, build stands, clean dirt, expand the park, play bonus cards and attract visitors. Each ride or stand cost a die with the corresponding symbol. The bigger rides cost more dice with the correct symbol. Stands give special abilities that can be used throughout the game. A broom symbol allows the player to remove 2 dirt from their park. Any symbol can be used to increase the size of the player’s park. Bonus cards can be played for 1 die each with the correct symbol, while visitors are a bit different. A die with a visitor on it, allows the player to place their choice of visitor color into the bag, shuffle it all up and then draw a visitor from it. If there’s a corresponding ride in the player’s park that has room on it, they can place the visitor on the ride. If not, the visitor returns to the pool of visitors. Once each player has resolved each of their dice, they will then receive money for each visitor they have on their rides. Players draw up to their hand size in bonus cards and replace the turn order tokens. A new round will then begin. The game continues until the end of the 6th turn. Players count up the dirt tokens in their park and check the dirt track to see how much money they lose. Players then add up their remaining money and the player with the most money is the winner. Now with all that in mind, let’s dive into this expansion. First off, there are now enough parts to be able to play with 5 players. This expansion includes a set of 5 white dice, pig board and starting ground tile. Players should also add the 4th player turn order token from this expansion with the ones from the base game. It should be noted that when playing with 5 players, there are only 5 turns, not 6 like in the base game. On top of the 5th player, the game also provides several new mechanics. First off there are the Stingy Visitors. These are wild visitors that are placed in the visitor’s pool and can only be added to the bag if at least one of the starting color of visitors is no longer available. When one of these visitors is drawn from the bag, they’re placed on any ride, regardless of color. When earning money these visitors only provide 2 Denari instead of the normal 3. However, they don’t gain dirt tokens either. It should be noted that although these visitors can be placed on any color ride, they are their own color and will not count towards any bonus card effects. Next there are new Ride Extensions. These are a lot like the rides themself and cost 1 hammer and wrench die for each space they have. However these can not be built by themselves. They must be attached to an existing ride. Rides can only have 1 extension attached to it. Any color visitor can be placed on an extension when attracting visitors. During the income phase, any visitors that don’t correspond with the color of the ride extension are placed back into the pool. When an extension is filled with visitors that are the same color as the ride it is attached to and/or wild visitors, the players suffers a penalty. Golden extensions cause the player to lose 2 danari for each space of the extension. Rusty extensions cause the player to gain 2 dirt tokens for each space of the extension. It should be noted that while these extensions are attached to a ride, they are a part of the ride, but still maintain their own color, not that of the ride. They will not count towards any bonus card effects. Another new mechanic is the park directors. One of these can be chosen or randomly decided upon at the beginning of the game. Each one has a unique ability that changes some of the basic rules throughout the entire game. The sweeper allows a player to discard half their dirt tokens for each 2 broom symbols they spend, yet a single broom has no effect. 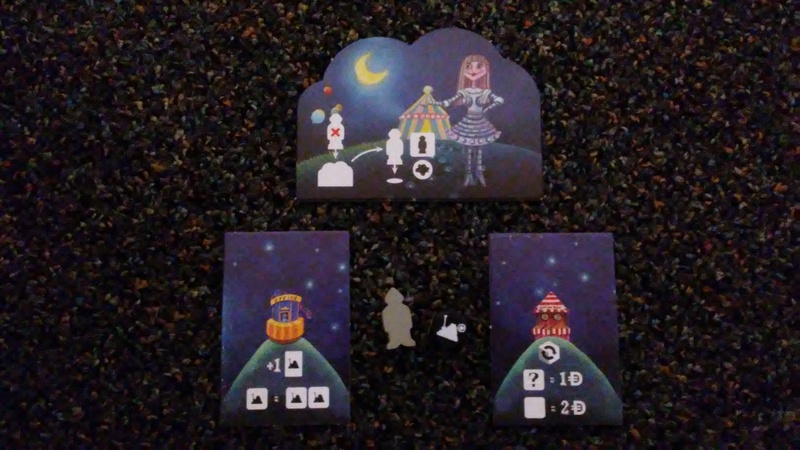 The gambler allows a player to place a bonus card face down beneath the tile when they play a bonus card. They will then gain denari equal to the round of the game. At the end of the game the player that can best fulfill each card gains the denari for it. The barker allows the player to place a visitor of the wrong color onto the tile. When attracting visitors, the player can take visitors from the barker tile instead of pulling from the bag. However they gain a dirt token for each visitor taken this way. The planner allows the player to only roll 1 time. They must then place their dice one at a time onto their pig board, changing it to whatever side they wish. The architect allows the player to build rides and stands adjacent to rides and stands of any color. The player also gains 2 dirt token whenever they buy a new ground tile. The tycoon allows the players to each start with 10 denari. However during the roll phase, players secretly bet an amount of denari. They must then reveal their bets and the player that bet the highest, discards the money they bet and steals a die from the player that bet the least. The player that bet the least is allowed to keep their money, however the other players have to discard half their bet. Yet another new mechanic is the espionage dice. This mechanic gives the player 4 denari and an espionage dice at the beginning of the game. Players roll this new dice along with their regular dice just like normal. Dice can still be placed onto the pig board to lock in the abilities just like normal. The same is true with the espionage dice. However it can’t be influenced by the effects of stands and it can’t be counted towards objectives on a bonus card. For it to be able to be used during the action phase, the player has to pay for it by discarding 4 denari at the end of the roll phase. However the player is able to pay 1 less denari for each white die with the same action on it on the pig board of the player to their right. Players can choose not to pay for the die if it has a dirt symbol on it. However they won’t be able to use it’s action then. Players are still only allowed to perform each action only once per turn. The espionage die may be used in conjunction with the regular white dice. The final mechanic that this expansion provides is the new stands. There are 5 new stand types included. Players can either choose or randomly draw 5 stands from the 10 stand types by using the reference tiles included in this expansion. The remaining stands are returned to the box. The 5 new stands are the fountain, hall of mirrors, office, shooting gallery and incinerator. The fountain allows a player to spend 2 denari to discard 2 dirt tokens at the end of their action phase. The hall of mirrors can be built adjacent to another stand, allowing it to copy that stands ability. However only 1 hall of mirrors may be attached to each kind of stand. The office increases the number of bonus cards the player is allowed to hold in their hand by 1. It also counts a die face of 1 shovel as 2 shovels instead, allowing them to play more bonus cards. The shooting gallery allows the player to reroll 1 die on their pig board during their action phase. For each reroll, the player gains 1 denari. However if they roll a blank face, they gain 2 denari instead. It should be noted though that if the symbol rolled is for an action that the player has already performed that turn, they may not perform it again. The incinerator awards a player with 2 denari if they have the most dirt during the income phase. Of course, just like with the original game, these abilities are increased if the player has more of the same type of stand. Just like with the original game, this expansion is full of quirky and fun looking pieces. Each one captures the theme and look of the original game quite well. The different ride extensions are very similarly designed apart from the actual artwork on the sides. The extra components for the 5th player are pretty much the same exact pieces as are included with the base game. The same is true of the extra bank notes that are included. The new stingy visitors are dark grey but are the same wooden shape as the original visitors. The espionage dice are similar to the original dice except that they are black instead of white. The stands are similarly designed with new artwork for the new stand types. What’s completely new looking is the park director tiles and the stand reference tiles. The park directors are all nice and big and look absolutely great. I love the art on each of these. They really sell the theme of the game in a big way for me. Each one also references the special ability that they have on the tile. These are awesome and are my favorite pieces of the expansion. The stand reference tiles are great for randomly choosing which stands to use during the game. They can be shuffled just like cards and can then be placed out on the table to be used as a reference for the abilities of each stand in play. Let’s be honest, I love the original game and all it’s quirky and fun theme. This expansion fall right in line with that look and gives you even more of that goodness. I love the new designs and all the new pieces. The rulebook for this expansion look really nice. It has a lot of the same humor and style as that of the original rulebook. There’s plenty of great looking pictures throughout the book. The rules are all laid out quite well and in such a way that players can pick and choose which modules that they’d like to use when they play. It’s very simple to read and understand. It’s actually one of the most fun rulebooks to read. I love the quirky humor throughout the book. Each new piece is covered in great detail so that there should be no problems when playing. Overall I love the look and the design of the rulebook. It’s really great fun to read and it does a nice job of covering the rules too. I have always enjoyed theme parks. I loved playing Roller Coaster Tycoon on the computer and building my own park. It’s no surprise then that I really enjoy Steam Park. It’s a lot of fun building rides and expanding your park. It reminds me a lot of those days of playing Roller Coaster Tycoon. This expansion adds even more thrills and excitement to the original game. It’s nice to have the added components to be able to play with 5 players. Normally I don’t have that many players but it’s still nice to have them anyway. The new stingy visitors are fun, however they don’t show up near as often as I’d like them to. It takes a complete run on a color before they can even start to be pulled from the bag. The ride extensions are great. They add a lot of freedom when drawing visitors from the bag, as you don’t have to worry about matching everything up completely. The park directors are my absolute favorite part of the expansion. I love how each one changes the gameplay up simply by changing the director for that game. The espionage dice take a little more work to use them efficiently, which can be a bit of a problem for the younger players. They’re still great to use with the game and I like how they change things up a bit. The new stands, like the park directors, are also great. I especially like the reference tiles. They add a lot more depth when combined into the game. Overall I like the new additions. It does tend to make things a bit more gamer oriented and a little less family but there’s still plenty of things that can be used with the family for them to enjoy as well. I would highly recommend this expansion, especially if you’re looking for a bit more challenge to the regular game. Steam Park: Play Dirty is an expansion for Steam Park that adds a lot of new content that may be added a little at a time or all at once. The expansion doesn’t really add any additional play time. Most game sessions still last around an hour. The artwork and components all share the same stylized look and feel of the original game. I love the look and humor of the rulebook. It’s rare when the rules for a game can make you laugh. All the different modules add different levels of gameplay which can make things more challenging and a bit more gamer and a little less family oriented. I will say that a few of the modules are simple enough and don’t get too out there to still be enjoyed with the family though. My favorite parts are the park directors and new stands. Fans of Steam Park will want to add this to their game, especially if they’re looking for a bit more of a challenge. I think this is a must have addition. I really enjoy it. I would highly recommend the expansion. Just like a roller coaster, this one is exciting. This entry was posted in Reviews and tagged board, board games, card, card games, dirty, federico, federico latini, games, iello, latini, lorenzo, lorenzo silva, park, play, play dirty, silva, steam, steam park. Bookmark the permalink.